Another promising intervention for CP is mindfulness-based stress reduction (MBSR). MBSR is a group-based intervention that focuses on building awareness and acceptance of moment-to-moment experiences, including physical discomfort and difficult emotions.4 Core components of MBSR include increasing awareness of one’s body, emotions, sensations, thoughts as well as learning self-regulation strategies and more adaptive responses to stress. Outcome measures: Based on the IMMPACT recommendations,8 outcome measures of interest were physical functioning, pain intensity, emotional functioning and patient’s global impression of change (PGIC). Studies were required to report at least one of these outcomes before and after treatment (within two weeks of start and end date). For this review, emotional functioning was restricted to depressive symptoms. Additional details regarding outcome measures of interest are provided in eAppendix 2 in the supplement. Types of studies: Only randomised controlled trials were included. Studies were identified through structured searches of electronic databases including Ovid MEDLINE, Ovid MEDLINE In-Process & Other Non-Indexed Citations, Embase Classic+Embase, PsycINFO and the Cochrane Library. The search strategies were developed and tested through an iterative process by an experienced medical information specialist in consultation with three content experts. The strategies used controlled vocabulary and free-text terms to identify studies pertaining to CP combined with the interventions of interest. Searches were executed on 4 April 2014 and updated on 12 October 2017. No date or language restrictions were employed. Grey literature searches were not performed. Manual review of the bibliographies of included studies was performed to ensure no relevant studies were missed. See eAppendixes 3 and 4 in the online supplementary data for the detailed search strategy. Study selection was conducted in duplicate by eight independent evaluators paired into teams. Evaluators trained, didactically and through pilot screening, on the purpose of the study, treatments being investigated, inclusion and exclusion criteria and outcomes of interest. We first screened study title and abstracts using liberal acceleration, followed by full-text screening. During full-text screening, disagreements among the evaluators were resolved through consensus (see figure 1 for a summary of the study selection process). Study selection. RCT, randomised controlled trial. Data extraction was performed using a standardised data extraction form in Microsoft Excel (V.2016, Microsoft, Seattle, USA). Two team members independently extracted data for all primary and secondary outcomes as well as a detailed description of the interventions, study design and population characteristics. Discrepancies were resolved by a third evaluator through discussions. The methodological quality of included trials was measured through a risk of bias assessment conducted independently by two evaluators using the US Preventative Services Task Force Quality Rating Criteria13 scale (see eAppendix 1 in the online supplementary material). Disagreements were discussed; if consensus was not achieved, a third assessor resolved the disagreement. Network diagrams were prepared to study the patterns of comparisons and outcome data for each endpoint. These figures convey the amount of information available for each analysis in terms of numbers of studies assessed per treatment and numbers of studies supporting each comparison in the network. The primary analysis for this review focused on comparisons between three groups: CBT, MBSR and control. Bayesian NMA of standardised mean differences (SMD) were performed to obtain summary measures of effect size across studies to quantify the impact of treatment relative to control. This enabled synthesis of data measuring the same outcomes using different scales. Included studies reported their findings using different approaches; some reported mean changes from baseline with corresponding standard errors (SEs), while others reported only mean values at baseline and post-treatment with corresponding standard deviations (SDs) for each treatment arm. We converted data in one study14 to the former scenario to use in NMA, assuming the variance of the change per arm was the same (see eAppendix 5 in the online supplementary material). For the latter scenario, we placed a prior distribution (Uniform (0.5, 1)) on the correlation between mean values at baseline and follow-up and assumed the correlation to be common across interventions and studies and calculated the mean changes from baseline and corresponding SEs for both arms when they were not reported. We modified a well-established model15 with a normal likelihood and identity link to perform NMAs on the SMD scale using the mean and variance of change from baseline per arm as inputs. The mean difference between any two treatment arms was rescaled by a pooled within-study SD (not depending on the SMD or mean difference) for standardisation. Comparisons of the effects of interventions for each outcome of interest were estimated as SMDs (Hedges’ g) along with 95% credible intervals. We used the RE meta-analysis model (DerSimonian-Laird)19 for pairwise meta-analyses on the SMD scale for each outcome (see eAppendix 7 in the online supplementary material 1). For studies in which only the preintervention and postintervention mean and SD per arm were available, we assumed that the correlation between preintervention and postintervention scores to be fixed at the posterior mean estimate of the correlation from NMA (RE consistency model). In addition to the primary analyses focused on comparisons between CBT, MBSR and control, in sensitivity analyses we also considered an alternative network geometry where the representation of control therapies was further refined. Analogous methods were used for all sensitivity analyses. A total of 10 936 unique records were identified. 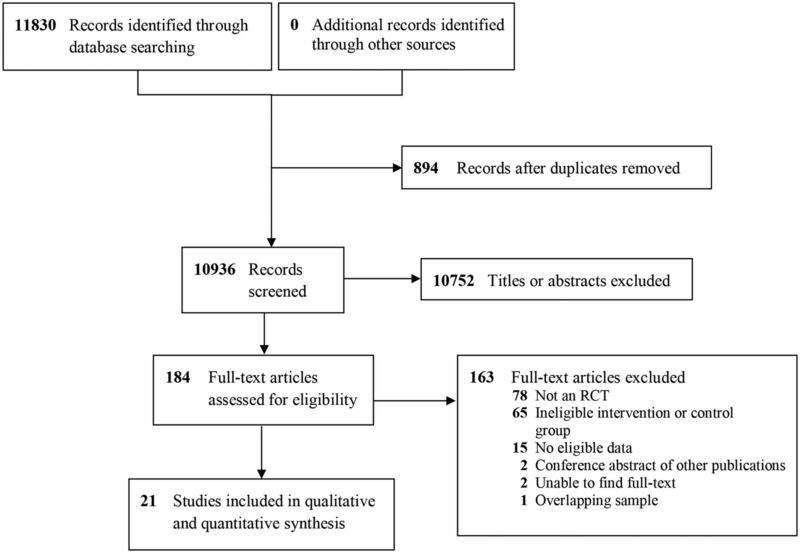 Screening of titles and abstracts excluded 10 752 irrelevant records, leaving 184 full-text articles for full-text screening. Full-text screening excluded an additional 163 articles (see eTable 2 for excluded articles and reasons), leaving a total of 21 publications describing 21 studies for the review.14 20–39 An overview of study characteristics is provided in table 1. 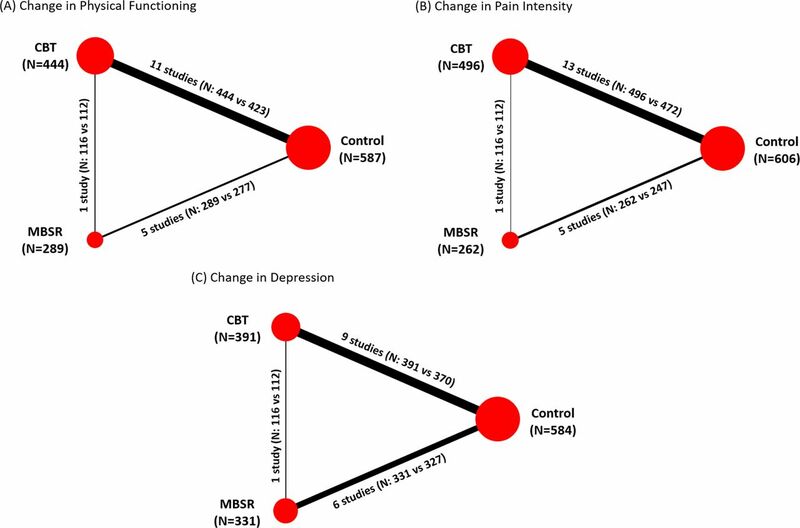 Figure 2, panels A–C present the evidence networks corresponding to the analyses of physical functioning, pain intensity and depression, respectively. Of the 21 studies, 13 evaluated the effects of CBT14 20 21 23 24 26 29 30 32 33 36 37 39 and seven investigated the effects of MBSR;22 25 27 28 31 35 38 one recent study directly compared MBSR to CBT and control.34 Minor deviations from the standard CBT or MBSR format were accepted after review and discussion among the research team. Among the 21 studies, 13 used a SC control group,14 20–22 24 25 32–36 38 39 six had a WL control group26–28 30 31 37 and two used an attention control (AC) group.23 29 Four studies evaluating CBT did not discuss therapist training,29 33 36 39 while the remaining studies had interventions administered by psychologists, physicians or social workers trained in CBT as well as supervised psychology students. Although one MBSR study did not provide therapist training information, the rest employed instructors participated in MBSR teacher training or certification courses at UMass Medical Centre.22 25 27 28 31 35 The MBSR interventions were administered by certified MBSR teachers,22 25 31 a psychotherapist and osteopath physicians,35 education counsellors,27 and a psychologist.28 Treatment adherence information was not provided in any of the MBSR studies. One study directly compared MBSR to CBT and a SC control group34 and involved MBSR instructors who received training from the Centre for Mindfulness at UMass Medical School or had 5–29 years of MBSR experience, while the CBT instructors were licensed psychologists. Network diagrams by endpoint. Panels (A)–(C) present networks diagrams of the evidence analysed for the three endpoints. Treatment nodes for each network were sized to proportionately reflect the numbers of patients randomised to each intervention included in the network, while the thickness of the edges joining the treatment nodes was sized to proportionately reflect the number of studies informing each treatment comparison. Note: One study was a three-armed study comparing MBSR (n=116) and CBT (n=112) and control (n=113).34 CBT, cognitive behavioural therapy; MBSR, mindfulness-based stress reduction. Of all studies included, 15 (71%) measured the differences in physical functioning,14 20–23 26 27 29–35 39 17 studies (81%) measured pain intensity14 20–24 26 29–31 33–39 and one-third measured symptoms of depression.14 20–23 25 27–29 32 34 36–38 Only one study had measured PGIC resulting in not enough data to analyse this outcome.34 Time points were the same for all studies where the baseline or pretreatment was within two weeks of treatment start date and post-treatment was within two weeks of the last treatment date. Model fit statistics for RE NMAs (consistency and unrelated means models) were found to be adequate and comparable to each other for all three endpoints based on comparison of total residual deviance with the total number of unconstrained data points. These values are provided in figure 3 and eTable 4 in the online supplementary material along with corresponding measures for FE consistency models where fit was found to be limited; inspection of DIC between models for all analyses consistently suggested the fit of RE consistency models was preferred. These tables also provide estimates of the between-study SD for all analyses. Findings from RE consistency model analysis identified differences of small effect size for change in physical functioning (SMD of −0.42, 95% CrI −0.94 to −0.10), pain intensity (SMD −0.34, 95% CrI −0.79 to 0.03) and depression symptoms (SMD of −0.49, 95% CrI −1.89 to −0.10) that favoured MBSR over control. Comparisons between CBT and control demonstrated differences of small effect size for change in physical functioning (SMD of −0.40, 95% CrI −0.82 to −0.15), pain intensity (SMD −0.37, 95% CrI −0.68 to −0.13) and depression symptoms (SMD of −0.44, 95% CrI −1.29 to −0.08) in favour of CBT. The comparison between MBSR and CBT provided no evidence of an important difference for any of physical functioning (SMD −0.02, 95% CrI −0.49 to 0.42), pain intensity (SMD 0.02, 95% CrI −0.43 to 0.48) or depression symptoms (SMD −0.06, 95% CrI −1.08 to 0.47). eTable 5 in the online supplementary material provides league table summaries of all pairwise comparisons of the change in each outcome. Additionally, eTable 6 presents a summary of the secondary effect measures (ie, SUCRA and mean treatment ranks) for each endpoint. The comparison adjusted funnel plots based on Hedges’ g and its SE were applied to assess for small-study effects (eAppendix 8) and provided evidence of minimal asymmetry. Summary of findings from RE NMA—SMD with 95% CrI. *Number of unconstrained data points=number of arms with reported mean change+number of arms with reported preintervention and postintervention data. CBT, cognitive behavioral therapy; CrI, credible interval; MBSR, mindfulness-based stress reduction; SMD, standardised mean difference. We also performed sensitivity analyses for each outcome measure where the control group was subdivided into more granular categories: SC and WL. The control groups in two studies received weekly attention-control phone calls23 and mailings of education materials,29 respectively, which were considered AC. AC was compared with only CBT and was indirectly connected to the rest of the evidence network through CBT, thus these two studies were excluded from sensitivity analyses. Findings from the sensitivity analyses are presented in detail in eAppendix 9 in the online supplementary data. Results from NMAs demonstrated that WL was not different from SC for changes in physical function, pain intensity and depression symptoms. Having subdivided control into SC and WL, all 95% credible intervals had widened as a consequence, which obscured the certainty of the moderate-sized SMD estimates of MBSR and CBT versus WL for changes in physical functioning and depression symptoms. Point estimates derived from NMAs in the current review were of comparable magnitude for CBT and MBSR, however 95% credible intervals associated with comparisons between these therapies were found to be very wide. Given this uncertainty and the paucity of head-to-head trials comparing them (only one study34), it is not yet possible to determine which intervention might be more beneficial for patients with different pain, medical and psychosocial presentations. This also aligns with a meta-analysis from 2016 on acceptance and mindfulness-based interventions for CP that showed small effects for pain intensity, pain disability and depression and moderate effects for pain interference postintervention compared with control, SC and education groups.40 Compared with the current review, the differences in effect sizes may be attributed outcome details as we did not differentiate between pain disability and pain interference as the 2016 review did. Similarly, in a psychotherapy meta-analysis for CP adults, Williams et al 41 found CBT to have small to moderate effects on disability, pain intensity and mood postintervention compared with SC or WL groups. While findings from this review support that both MBSR and CBT show benefits related to physical functioning, pain intensity and depressive symptoms for patients with CP, the results should be interpreted carefully; only Cherkin et al 34 directly compared MBSR and CBT, and there were considerably fewer MBSR studies compared with CBT, resulting in smaller MBSR sample sizes and potentially limiting the reliability of the results. While estimated differences between these therapies approached 0, they were associated with wide 95% credible intervals. Additional studies directly comparing MBSR and CBT are needed. Findings from quality assessments in this review suggest that more efforts are needed during the design stage to enhance the rigour of future studies, including the use of standardised measures and standard follow-up time points (eg, up to 12 months). The extent of uncertainty in our findings can be partially attributed to the fact that most of the included studies had reported outcomes in terms of mean values at baseline and post-treatment with corresponding SDs, while few studies reported mean changes from baseline with corresponding SEs for each treatment arm. To address this difference, we assumed a prior distribution on the correlation between mean values at baseline and follow-up to calculate SEs of the mean changes from baseline, which was an indispensable step to completing analyses but introduced more uncertainty. Several forms of clinical and methodological heterogeneity were noted among included studies. Although 15 studies (71%) had an additional follow-up, they ranged from 8 to 52 weeks postintervention. We recommend a consensus be established on the timing of follow-up to determine whether the benefits of the interventions are sustained over time. Having a heterogeneous group of outcome measures and time points complicates the pooling of data and makes comparison among studies more difficult and potentially less meaningful to patients, clinicians, researchers and decision makers. This heterogeneity may also be a contributing factor to the varied treatment effects found across the studies in this meta-analysis. Additionally, the variability in diagnoses of CP and the range of therapist qualifications and participant demographics represent other sources of between-study variability. Another limitation was the lack of intention-to-treat analyses in nearly half the studies in this review (48%).21 24 26 29 30 33 35–37 39 Also, there were no subgroup analyses to see if participants with different characteristics responded differently. Determining if certain patient characteristics predict response to CBT or MBSR is important to inform clinical guidelines. To conclude, while CBT is considered to be the preferred psychological intervention of CP, not all patients with CP experience a clinically significant treatment response.2 Although a number of recommendations have been proposed to improve CBT for patients with CP,46 an additional solution may be to offer patients MBSR since it shows promise in improving pain severity and reducing pain interference and psychological distress. Additional and more rigorous research that compares CBT and MBSR directly and includes more information about patient characteristics, therapist training and treatment adherence is needed to draw definitive conclusions to inform guidelines. This review would like to acknowledge: Howard Nathan, Catherine E Smyth, Ola Mioduszewski, Heather Romanow, Erin O’Farrell, Carley Chiasson, Morgan Dufour, Aaron Zambrana, Myka Caluyong and Chris Lepage. IASP. Unrelieved pain is a major global healthcare problem. 2004.
. Full catastrophe living: Using the wisdom of your body and mind to face stress, pain, and illness. Delta, 2009.
. Classification of chronic pain, Part III: pain terms, a current list with definitions and notes on usage. 2nd edn, 2011.
. Full catastrophe living: using the wisdom of your body and mind to face stress pain, and illness: Delta Trade Paperbacks, 1990. National Institute for Health and Care Excellence. Evidence Synthesis TSD series – NICE decision support unit. http://scharr.dept.shef.ac.uk/nicedsu/technical-support-documents/evidence-synthesis-tsd-series/ (Accessed 6 Sep 2017).
. Statistical power analysis for the behavioral sciences. second. New York: Lawrence Erlbaum Associates, 1988.
. OpenBUGS user manual. 2014 http://www.openbugs.net/w/Manuals.
. Mindfulness-based stress reduction for failed back surgery syndrome: a randomized controlled trial. J Am Osteopath Assoc 2010;110:646–52.
. Change in Psychotherapy: a plea for no more "Nonspecific" and False dichotomies. Clinical Psychology: Science and Practice 2005;12:198–201.
. Cognitive-behavioral treatments for chronic pain. 21: What works for whom? 2005:1–8.